We have been entering some perilous times recently and I can’t imagine when Joseph Schrumpeter outlined his groundbreaking efforts for explaining “creative destruction” he or anyone else, could image this being flipped around to what we are facing more today, that of “destructive creation”. Schrumpter saw “creative destruction” as the renewing, through new innovation, society’s dynamics that would lead into higher levels of economic development and welfare. At the same time recognizing that this destroyed a few of the incumbents to the benefits of many more newcomers and increasing value creation for broader society. The shift has placed the emphasis on the role of destruction rather than creation in driving innovation activity. This is getting uncomfortable, innovation then becomes not so good for you perhaps? This is becoming the game for a few to make money, to corner markets, to dominate and wanting to achieve monopolistic positions and not so worried over the wealth creation aspects of creating jobs, building communities, cherishing certain values. We need to be on guard in understanding the fundamentals within innovation as it should advance for the good of society, not be actually working to its detriment. Actually who is benefiting from the distribution of new wealth? The developed world is seeking desperately ways to regain growth but it needs to be more equitable, not in the hands of a few that determine our choices but increasingly seem unaccountable for their actions. Asia was another example; its lightening speed in its growth had lead to a recent financial crisis simply triggered by capital account converting that shifting into a myriad of different financial instruments. The downside of that had not been anticipated in policy intervention and we had a significant scale of financial destruction that was not creative but destructive in its effect to the economies for some time. Again many people lost out, for some, recovery from this effect never occurred -it changed their lives, often to start again. Let’s take Greece and its ‘melt down’ of the past twelve months. Could we have predicted the massive social unrest and serious economic decline in the approaches taken by the parties responsible for managing an orderly recovery? How many times are we hearing “structural adjustment” to cover massive upheaval and watching a civil collapse happening on front of our eyes. Thousands of previously healthy businesses in Greece are being starved of finances, of demand and caught up in such social upheaval. This is destructive creation for the many who have got caught up in the ‘collective adjustment’ applied. How will the Euro shake out in the coming months when our leaders just seem unable to get their heads around its complexity? This is a proliferation of complexity fuelling uncertainty. Is this because we have been great inventors and innovators or poor at working through all the consequences as analytics alone can’t explain these things in coherent ways, we just watch “destructive forces” being applied in the name of social and structural adjustment sweep away whole swaths of creative good as well. The pursuit of growth and wealth is fine but are we balancing the conflicting values, consequences and upheavals well enough in the equation, otherwise it tips from this “creative destruction” over into “destructive creation” and that is not a healthy place for innovation to be. I know Steve Jobs and what he built at Apple is regarded as a beacon of success but there is a darker side to this. High rates of innovation, often not truly needed, can be disruptive to the larger society as a whole. A few jobs, many outsourced into low cost environments is leading to a jobless growth in the rest of the industry, it is destroying the usage value (useful life left) of existing products to the benefit of the few, rather than the many. Some might call this a “shutdown game” establishing conditions that negatively affect values of other products, or is that still called offensive marketing, knowing exactly what the customer needs? I’m not 100% convinced. Shareholder value is our focus point but what about the shut downs, those old, empty, rusty building that seem to be increasing not decreasing. We are faced more with de-industrialization issues than seeing re-industrialization coming from the present ‘destruction’ forces unleashed upon us all today. What is the cost of disruption and destruction of whole communities in social costs, in our investments for the future when we can’t ‘feel’ or see the benefits of “creative destruction” emerging? There are many industries that start out thinking they are on the path to “creative destruction” but somewhere along the road got flipped into “destructive creation”. Often this was not the intended path but it became the consequence. Adding more just reinforced the greater destruction leaving it less creative, except in pockets of expertise. Pressures suddenly built. Competition fell away, they went into troughs of uninspiring innovation for some time. Consumer software upgrades come to mind here, killing off perfectly good software to force us into upgrading but actually pushing us to search for alternatives, killing off useful gained knowledge and continued utility. 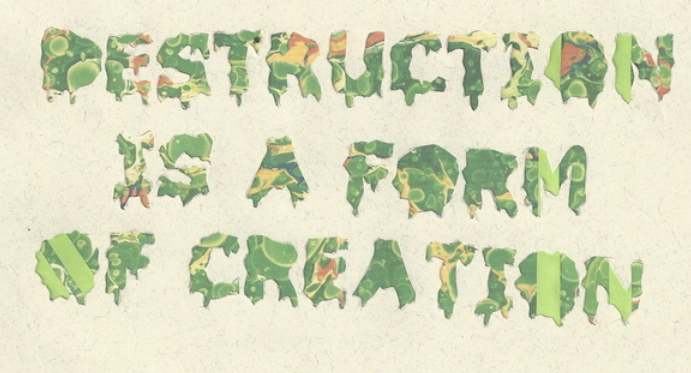 Where is the cross over point in “creative” and “destruction”? For instance, if our banks don’t change as society is perceiving they should, and the policy makers seem unable to work through the complexity of this level of change, then society has two choices: remain with the present system where a few seem to gain over the majority, or seek out a change in the financial lending system so society again puts back “creative” at the front of “destruction” to benefit the broader community. Let’s be honest, the banking industry has not been so innovative in many ways, besides enhancing wealth creation by the use of financial instruments or just to constantly sustain the existing ‘world order’. Will an alternative to our existing financial system evolve and or disrupt, but at what destructive cost? There is, when you look around, a lot of seemingly partial and disconnected aspects to our advancement. Where are we in our debates on climate change, stem cell research, toxic chemicals, landfills and plenty more. How will we manage the feeding of the world in years to come? How will we manage the old and sick. How will society re-integrate growing groups who are getting disenfranchised? All of these can be destructive or built on constructive ways that ‘create’ orderly change. Yet, they seem bogged down in complexity, opposing forces and we are not breaking through these in new order ways. We somehow must. It is interesting observation, we do seem to have moved back to enjoy narratives, myths and cult stories more than in the past, is that a yearning for something from the past in our lives where one person tells a story that just made sense as it seemed full of wisdom and real good for many? I think we, as humans, have been reduced down and until we can regain mastery over the complex, needing a structural and societal adjustment or we otherwise will continue to suffer the consequences of “destructive creation.” I think we might start yearning for the good old days of just “creative destruction.” Is technology leading and we are lagging? Can we regain control? Emotional attachment prompts some incredibly strong bonds, a host of clear affections and different reactions when it comes to our favourite brands or products. When something suddenly ‘disrupts’ this, it triggers a set of mixed emotions that shakes you and stirs up different feelings that take some time to re-order in your mind. I try to seek understanding and then simply have to let go, even when they so often staring you in the face. Sometimes you still don’t want to finally let go until you are ‘hit’ by such a disruptive event. One of those has happened to me with the filing of bankruptcy protection under Chapter 11 for Kodak. For so many people those “Kodak moments” make up such incredibly important parts of our lives. Stuffed under the beds, in boxes, in cupboards are those images of youth, family, important occasions and holidays that sit happily in the back of our minds waiting to be prompted by those images captured with the help of Kodak. Hindsight and that regrettable smugness, that seems to always emerge. I’ve been reading in the past week or two about all that might have gone wrong at Kodak and you feel that certain smugness that hindsight often gives us. I wish all that I read would make it so simple. I’d argue you should ‘walk in someone else’s shoes’ before you rush to offer reasons and cause. In Kodak’s case such a fundamentally different technology was unleashed, the ability to see what was coming towards you at such a rush and from so many sides was never easy and I’m sure they tried. Disruptive technology can be subtle as well as prominent in its impact. Confronting something so enormous in a society’s movement to this change would challenge anyone. Technology, especially digital technology, has been such a whirlwind of ‘creative destruction’ taking Blockbuster, Borders and other film producers that were caught out in this- Ilford Photo in 2004 & Agfa in 2005. All I know is we can expect that many more will be caught in the new technologies ‘destructive’ path. Process technology is under enormous threat. Not just Kodak but similar transitions are being managed (or not) by newspapers, book publishers, movie studios, broadcasters, record labels although some of the issues are different it is technology, new technology, that is reaping the destruction. Yet the core is stronger than ever- capturing moments digitally, storing and using information and pushing entertainment in new ways. It might be also premature to fully write off Kodak. It has this protection and from this a certain time and space to restructure and by all accounts, it has a technology portfolio potentially worth billions. To remake itself though, is going to be really tough, I grant you that. I can think of three really important ‘shock and letting go’ moments for me in recent years. Kodak being the latest one, the other two, for me, was Swissair, the icon of everything Swiss and F W Woolworths, or “Woolies” a real icon for the Brits. Swissair got so caught out after the terrorist attacks in September 2001 as it was in the middle of a massive expansion plan and was suddenly hamstrung with debt and a wrong strategy of expansive exposure. Bad ideas, poor top management left the airline in an incredible state of providing large sums of cash to their pilots to purchase fuel at foreign airports. It shocked the Swiss, it shook me also as this was the one airline I had real emotional attachment too when it ceased trading in 2002. Living in Saudi Arabia, then followed by Kenya and travelling to some less secure countries in Africa and the Middle East, Swissair stood out like a beacon. One you could run too every night, come rain, sun or attempted coup attempt that seemed to occur all too frequently, in the 1980’s, whenever I travelled in these regions. That tail fin seemingly always illuminated to show the national red flag with a white cross (a bold, equilateral cross) in its centre. On board Swissair simply conveyed those Swiss values such as “personal service”, “in-depth quality” and “typical Swiss hospitality” and “reliability and dependability,” offering a safe haven. Letting go was hard. I’ve never had the same emotional attachment since with its revised Swiss International Air Lines and part of the Lufthansa Group. I let go of a strong emotional attachment. I grew up in the UK and Woolworth’s was essential in my life. You entered the store confident you would find that something you needed and many things you didn’t but ended up buying. With over 800 stores at its peak, Woolworths was very much a part of everyone’s lives on the High Street. You got your basic school supplies (pens, paper, ruler), sometimes a bargain item of clothing, basic house-ware but for me, its magic was the ‘mix and match’ sweet counter. Any selection of sweets for the same price and all you had to do was select them and then take them for weighing. Did I love that, my parents I think less so, although I can often remember their hands ‘snaking’ into my sweet bag pulling out their favourite sweets well enough. So when Woolworth closed, some real emotional attachment suddenly detached and floated away into the memory. Kodak is up there in emotions for me. It simply has played a role in my life, my family’s life throughout most of the 20th century. Those slides, those prints hold our most treasured possession- our memories. I’ve already lost far to many in my countless moves, rashly thrown away. Digital images just do not seem the same, no feel, that tactile effect. Digital certainly triggers reactions but not that moment but they are certainly easier to store. But for me nothing evokes more emotion than a faded, slightly out of focus picture that you are forced to focus upon to make out the details. Would I have preferred these on digital, perhaps, but having that print in your hands, passed down from parent to parent or from a friend who took the picture, not to post it on Facebook for all to see but to hand it to you, so you could both relive that moment and what it meant, a tangible connection- a real provenance. Emotional attachment is important for brands to build into our lives. As we work through innovation we often forget the emotional aspects of people, emotions and relationships. Today Apple stands out in achieving that. One real trigger that Kodak prompted in me was revisiting the ten commandments of emotional branding suggested by Marc Gobé as they need to be revisited when we go about our innovating business for business, products and services. Based on the book Emotional Branding, written by Marc Gobé and updated recently as “Emotional Branding: The New Paradigm for Connecting Brands to People” as fully revised paperback edition. This is a terrific list about brand feeling which can be defined as peoples emotional reactions and responses to brands. These brand feelings also relate to the social currency induced by the brand which can be positive, negative, intense or mild. Identification is still so important for lasting relationships between company and customer. So why do big companies suddenly fail? The reason is that while big companies are often good at fostering “sustaining” innovations – ones that enhance their positions in established markets – they are generally hopeless at dealing with innovations that completely disrupt their market. They fall into that trap of consistently looking at solutions through their lens of the market; they want to always put existing assets into the new business. They fall victim to their history and this baggage becomes an increasing liability that gives huge drag at the very time you need to be bold. This is their emotional attachment. When you have something iconic, full of emotional investment, something that defines an industry, standard or practice, it simply is not easy to let it go. Companies can in theory live forever but today if you are not willing to cannibalize yourself, it does seem others will do it to you. Applying Innovation today is often like being in a fight to the death or struggling on a path to survival, it is a constant march searching and sensing for possible change points, investing in the creation of new and often untested ideas, to learn and discover and to shed those that can’t match this new ‘creative destruction’ going on around us. 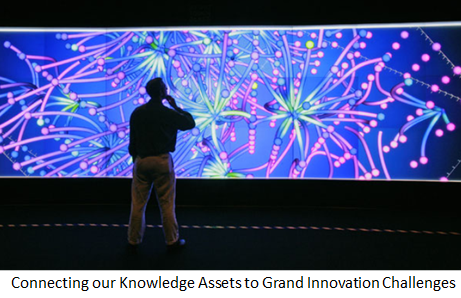 Innovation is absolutely essential so we have to embrace it, like it or not in what it disrupts that is all around us. Kodak was well aware of the future; it failed to confront it with a strategy that needed to be more ‘transformational’, ‘revolutionary’ or ‘evolutionary’. Sustaining innovation must be either ‘discontinuous’ or ‘continuous’. Today it is expected, big companies simply disappear if they don’t do great things, executed well and on time to stop destruction hammering at their door but please don’t tell me this ‘letting go’ of what we have is easy or simple, it is not. It is full of emotion. The reconstructive rides we face. Sustaining does not come from incremental innovation; it comes from embracing amazing things and letting go often faster than you like in what you have built up in legacy and getting that right is really, really hard. No wonder there are more and more successes coming from start ups with no emotional baggage, they don’t need to deal with these harder emotional issues. Emotional attachment, we all have them and to simply let go is not so easy and this should not just happen when we are facing those disruptive moments, we need to equip ourselves a lot earlier. The issue is seeing the challenge early and plunging into it head first, confronting it, taking the wild ride that comes from such destructive forces and hoping you come out the other side better. I think there are going to be more and more of these ‘destructive to reconstructive rides’ I feel in our present challenging times. Sometimes we simply have to let go. Hard times need a plan, based on what-survival? I was looking through some ‘sage’ advice from McKinsey on managing in a crisis, in really hard times, and one really got me thinking, so I thought I’d share this. “Use the hard times to concentrate on and strengthen your competitive advantage. If you are confused about this concept, hard times will clarify it. This challenged my thinking of competitive advantage but then again hard times certainly do questions all our thinking. I always felt it was the uniqueness within, in what you offered, that separates you from your competition. This alters that perspecitve. It seems this piece of advice boils down to the hard dollar gained by showing advantage within the market place- where it really counts, in fighting for every sale by being able to make a profit or simply cover your costs to simply keep going. Isn’t innovation simply stripped away here-lost, forgotten, ignored, abandoned? Just thrown overboard along with any branding and this seems so stark or am I missing something here? What happens when markets come back? Maybe you have survived and you pick up the pieces. Do you agree this is where competitive advantage lies? Perhaps this is ‘creative destruction’ and ‘innovation productivity’ in its rawest form? See my recent article on ‘seeking innovation productivity through creative destruction’ on this.